Yule is the original Norse-Germanic Pagan festival that marks todays Winter Solstice before it was replaced by the christian version of ‘christmas”. The lyric from “Deck the Halls” goes “Troll the ancient yuletide carol.” Amidst all the fa-la-la-ing, did you ever ask yourself exactly what yuletide is? 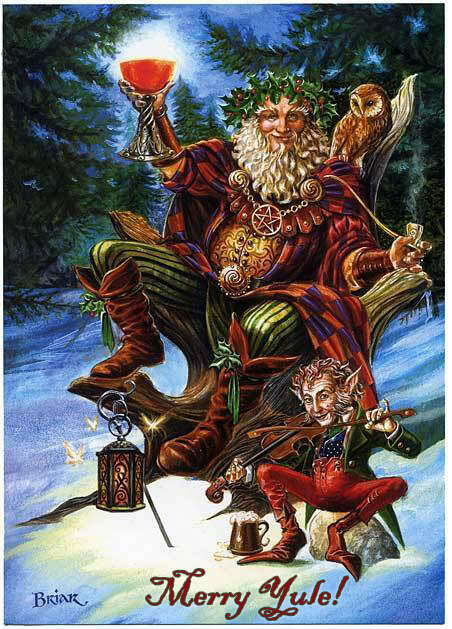 Yule is the ancient name in the Germanic lunar calendar for a winter festival corresponding to December and January. Later, yule referred to the twelve-day holiday associated with the Feast of the Nativity after the widespread adoption of Christianity through Northern Europe. The word has Gothic origins, but English speakers are most familiar with yule through associations dating to its original use. For example, the yule log, as in the lyric “See the blazing yule before us,” was originally a real tree limb or trunk, but now makes an appearance at Christmastime as a cake shaped like a log. At this feast all were to take part in the drinking of ale, the sacrificing of livestock culminating in the meat of the animals being boiled and served as food to the attendees. Fires were to be lit in the middle of the temple floor, and kettles hung over them. Toasts were to be drunk. The first toast was to be drunk to Odin “for victory and power to the king”, the second to the gods Njörðr and Freyr “for good harvests and for peace”, and thirdly a beaker was to be drunk to the king himself. Many toasts toasts were also drunk to the memory of departed kinsfolk. These were called “minni [memorial toast]”. A Yule Goat is often portrayed as having carried Father Christmas on his back and is a symbol of Christmas throughout Scandinavian countries. The Yule Goat may have associations tracing back to Norse mythology. The now-famous comic book god Thor rode in a chariot pulled by two goats that could also be eaten and magically regenerate into living creatures again.